This post is based on some writing by Dr Hank Robb. Hank is a deeply wise psychologist based in Oregon. You can see a video of him here. Sometimes, when we act to make something important in our lives, we experience painful emotions. And, we can choose to feel them willingly. both kinds. Some won’t get on the airplane – they lack “willingness with their feet.” However, many who do get on the plane are then “white knuckleflyers” – they lack “willingness with their heart.” Both kinds of willingness are choices. To give you a sense of “willingness with your heart”. Cup your hands. Imagine holding a feather in your cupped hands, it will be gentle. And, you can hold it gently. 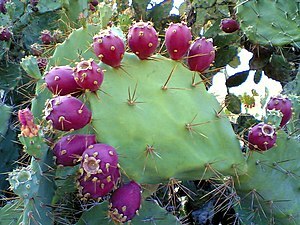 Now imagine putting the fruit of a prickly pear cactus in your cupped hands. It will not be gentle. And, you can still hold it gently. Willingness with your heart is holding gently whatever is there to be held. Whatever feelings turn up, you can choose to treat them with compassion and gentleness. What would that be like? Which are the emotions that are hardest for you to hold with gentleness? For me anger is really tricky. Can you catch yourself when you harden your heart against your pain…and soften? Previous Post If You Had a Couple of Extra Hours In The Week, What Would You Spend Them On?